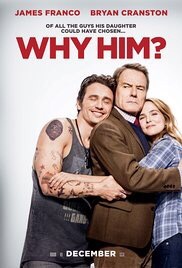 ‘Why Him?, is a raunchy rehash of ‘Meet The Parents’ and feels like a movie you have seen before. Starring James Franco and Bryan Cranston, one wonders how talent like them were persuaded to do this movie. And you realize it’s money that made them do it. This film opened Christmas Day, and had the gall to go against a movie like ‘Fences.’ But I guess not everyone wants to see Oscar bait movies. There’s a huge part of me that has total disdain for this film, but I gotta admit this made me chuckle a couple of times. Franco is nice to look at, and both he and Cranston are pretty game. The gags feel all recycled, and the jokes familiar, but the actors kind of made it work, to be honest. This is definitely a Saturday night kind of Movie when you cannot find anything else to watch, and cannot be bothered to think and want to just relax. Just saw it the other day. Pretty funny, but I’m glad I didn’t watch with my parents or in-laws. My husband and I have been joking about some parts of the movie.